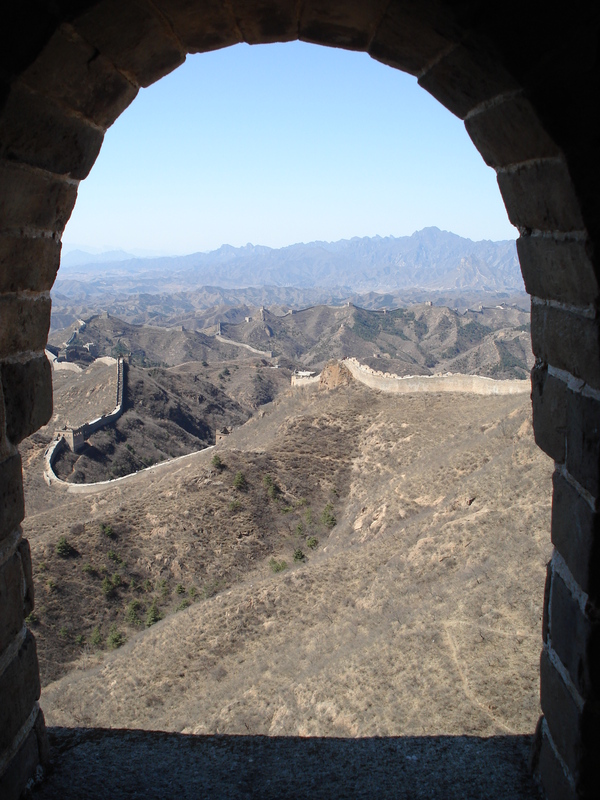 Without a doubt the best thing I saw during this Beijing trip was the Great Wall of China. It was unforgettable. The words I would use to describe it are incredible, astounding, unbelievable, unimaginable. How on earth they ever built such a mind-blowing and bizarre structure, and so many years ago, is beyond comprehension. Snaking its way across every mountain and peak and craggy cliff, the Wall never seems to stop, stretching all the way to the very coastline of China. The station closest to Beijing proper, Badaling, is from the sounds of it overrun with tourists, crowded, covered in crappy souvenir stalls, and the section of the wall which has been modified, upgraded, uplifted, and redone to make it safer and more tourist friendly. 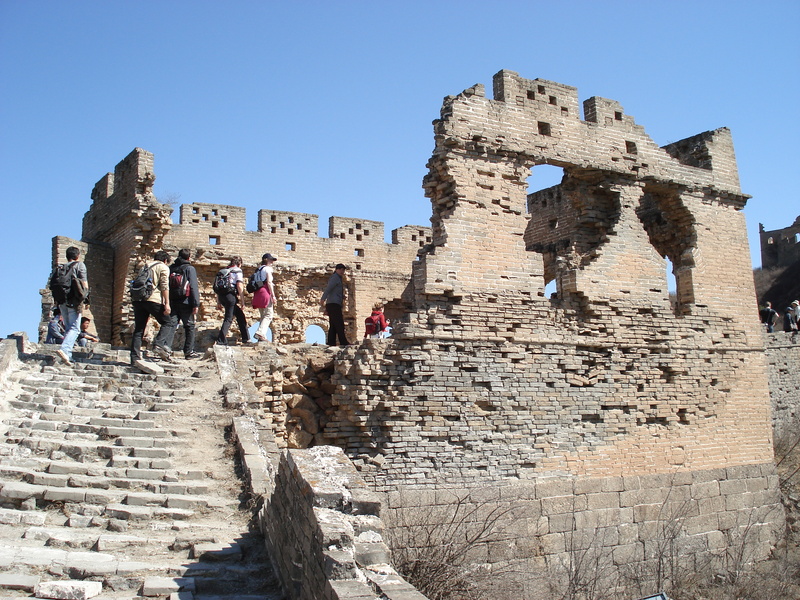 Most people visit Badaling as a brief stop during a whirlwind visit to take a few pictures, but it is considered the least authentic area of the Wall to go to. 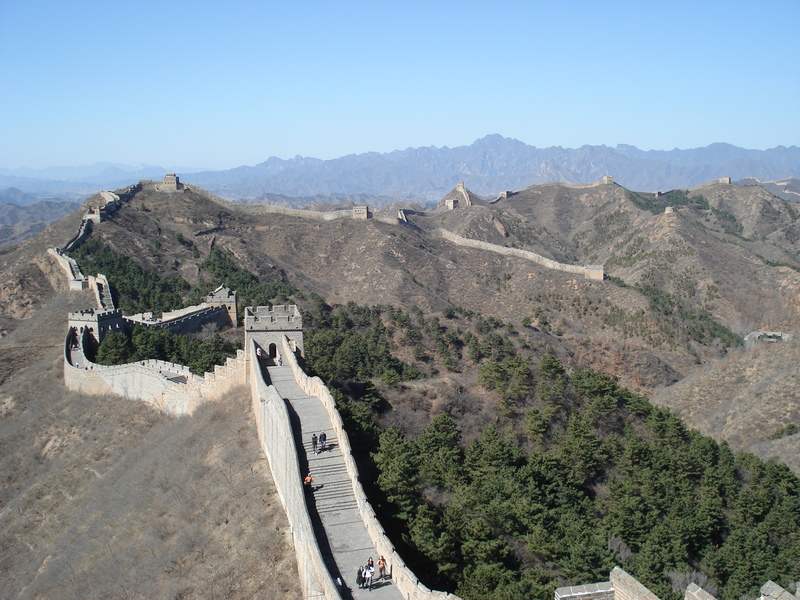 So instead, I signed up for a hiking trip to the section of the wall that is the furthest away that you can get from Beijing and still do as a day trip. 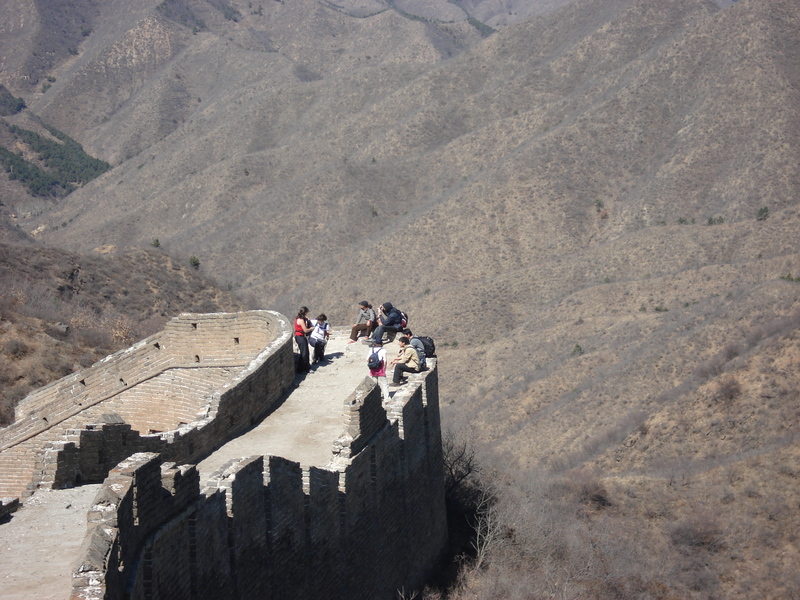 The section that I hiked — from Simatai to Jinshanling — is referred to as ‘The Wild Wall’ because it is pretty far away from Beijing city, about a 3-hour bus ride each way, and thus attracts few tourists. Anyways, the Wall is incredible, the hike is very beautiful, and after days of stink, nasty pollution in Beijing, a breath of fresh air. Bright blue skies and fluffy white clouds. Quite challenging in certain sections as the steps are massive and it puts a lot of pressure on your knees and thighs. One woman made the mistake of wearing a cute pair of heels. 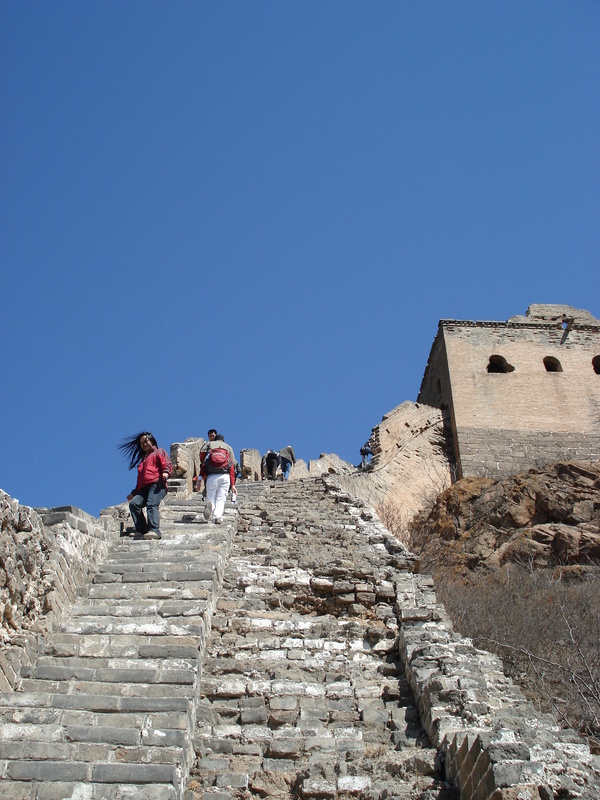 Perhaps she thought she was going to Badaling, and not hiking two and a half hours across a massive stone structure! It actually wasn’t too hard of a hike, but it really is a lot of up and down. It’s like the architect stood up on a peak one day, pointed with his finger, and said, ‘build it all the way east’, and the devoted workers shrugged and did just that, regardless of the terrain. When the land rose up, they built along it. When the land plunged down into a river, they kept going. Up and down and up and down, over and over again. It is truly an example of Chinese persistence. 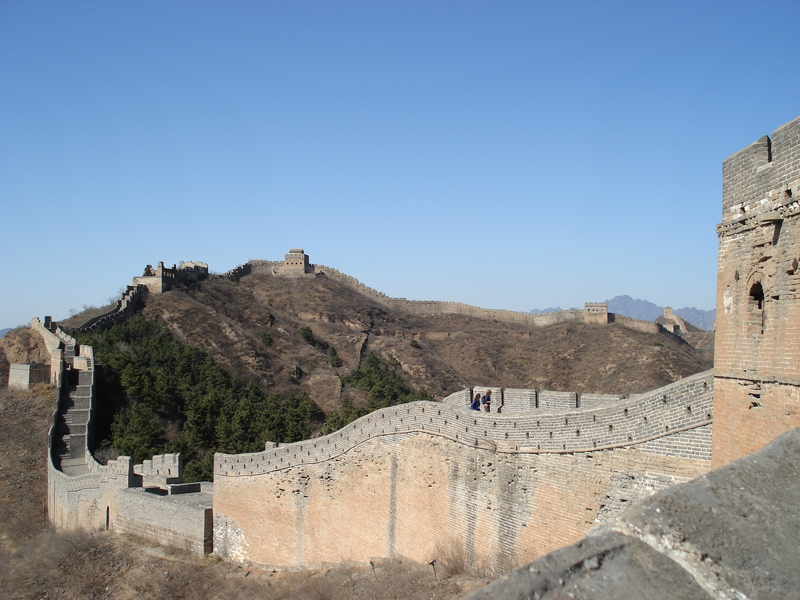 The Great Wall is truly a must-see during any itinerary to China, and I would highly, highly recommend going to the Simatai-Jinshanling route to really have the place to yourself.